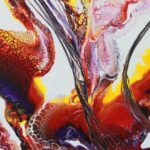 Biographical Info Renay's current focus is creating abstract paintings with fluid acrylics, but over the past decades has created more representative works with brushes in acrylic and watercolour, as well as pencil/coloured pencil. Renay has been a member of the Eastman Artists' Collective, until it folded, and Cre8ery Gallery during the past decade. In 2013, Renay was awarded first place in watercolours in the Eastman Juried Art Show and, in the same year, was awarded a 3rd place for a coloured pencil work in the Red River Exhibition Juried Art Show. Renay has only recently begun to actively sell her art and is doing so successfully via online galleries.